Fat Diet? Are You Eating The Right Fats? Fat Diet? Are All Fats Evil? There are good fats and there are bad fats. There are plant based, animal based and artificially produced trans-fatty acids. Trans fatty acids are bad in any amount and saturated fats from animal products should be kept to a minimum. The best fats or oils rather, since they are liquid at room temperature, are those that contain the essential fatty acids so named because without them we die. These fats are usually unsaturated fats or oil. Essential fatty acids are polyunsaturated and grouped into two families, the omega-6 EFAs and the omega-3 EFAs. Seemingly minor differences in their molecular structure make the two EFA families act very differently in the body. While the metabolic products of omega-6 acids promote inflammation, blood clotting, and tumor growth, the omega-3 acids act entirely opposite. Although we do need both omega-3s and omega-6s it is becoming increasingly clear that an excess of omega-6 fatty acids can have dire consequences. Many scientists believe that a major reason for the high incidence of heart disease, hypertension, diabetes, obesity, premature aging, and some forms of cancer is the profound imbalance between our intake of omega-6 and omega-3 fatty acids. The appropriate ratio of omega-6 to omega-3 of about 2:1. A massive change in dietary habits has changed this ratio to something closer to 20:1 and this spells trouble. Poor choice of fat diet leads to poor health. If omega-3 fats are the good guys, then trans fats are the villains! Though there are regulation required foot manufacturer to have trans fat listed in the food label, however that is limited to packaged food produced in the factories. Restaurants and food hawkers are not required to list the trans fat usage in their menus! To tell if any food product has trans fat is to look for the words "hydrogenated oils" or "partially hydrogenated oils" on the label. Be aware of some trans fats are present naturally in some natural food source like butter. But it is at a very insignificant percentage, which we should not be concern about. It is unfortunate that trans fat is the ingredient in food most Americans like to eat — crackers, cookies, potato chips, French fries, stick margarine — and contributes to the heart disease and obesity that is sweeping the country. So, it is your move to make a choice to replace trans fats in your diet with polyunsaturated or monounsaturated fatty acids which help lower blood cholesterol levels. Avoid certain food, which is high in trans fat at all. Change your habit to eating less high fat processed foods and more fresh fruit and vegetables. Oil from fish contains eicosapentaenoic acid (EPA) and docosahexaenoic acid (DHA); both are omega-3 fatty acids. Where is it found? EPA and DHA are found in mackerel, salmon, herring, sardines, sable fish (black cod), anchovies, albacore tuna, and wild game. Cod liver oil contains large amounts of EPA and DHA. Omega-3 acids are found in flaxseed oil, walnut oil, and marine plankton and fatty fish. The main component of flaxseed and walnut oils is alpha-linolenic acid while the predominant fatty acids found in fatty fish and fish oils are eicosapentaenoic acid (EPA) and docosahexaenoic acid (DHA). The main sources of omega-6 fatty acids are vegetable oils such as corn oil and soy oil that contain a high proportion of linoleic acid. Fish oil supplements typically contain 18% EPA and 12% DHA, though more purified (i.e., higher in EPA and DHA) fish oil supplements are sometimes available. You certainly have a choice in your fat diet. Now you can choose the good fats over the bad fats and live a healthier life. Related reading: Benefits of good fat diet. Where To Get Omega 3 Supplement? 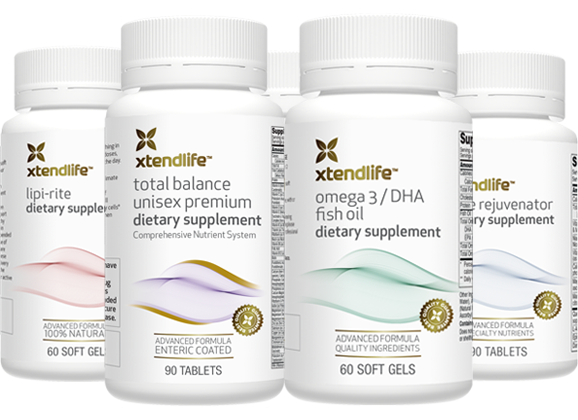 We recommend Xtend-Life's Omega 3 Fish Oil, which is a very reliable natural vitamin supplement manufacturer in New Zealand. Read our Xtend-Life Review about this company and visit Xtend-Life online store here. Go to top of fat diet page.